In common with many people, I have always been attracted to images from the underwater world and soon after learning to dive, I aspired to produce my own. In 2006, I bought my first underwater camera, which was a simple compact with a single strobe. My first underwater images still serve to remind of a fantastic holiday. However, compared with the stunning pictures that adorned the pages of my favourite coffee table books and web sites, they looked poor. So I embarked on a modest investment in my skills. I began by absorbing everything that I could from books and web sites (and the Underwater Photography Guide is superb – well done, Scott), but my real break through was taking one day of personal tuition with a renowned UK underwater photographer and then a week-long dedicated underwater photographic workshop with another. You will be your own judge, but the experience took me from rank amateur producing pictures devoid of colour and interest, to a much more confident photographer who has even achieved a small portfolio of competition-winning images. It leaves me convinced that dedicated instruction and workshops are the best way to advance skills quickly. I highlight just a couple of images below, which for me have encapsulated the value of professional instruction, because the pictures are now being recognised by fellow photographers (something that I had not achieved before). The first image is of a Southern Stingray. Photographers the world over have taken millions of images of the sociable Stingrays that swim to the North of Grand Cayman in only a few metres of water. This particular shot was taken just after dawn using natural light and a red filter, but it is most attractive for me due to the wonderful blues and the frozen upbeat of the Ray’s nearside wing, which reveals the Remora hitching a ride underneath. The dominant feature is the natural light, which brings out beautiful surface and sand patterns, both of which provide in turn a strong frame for the main subject. This image was placed 13th in the overseas category of the 2010 British Underwater Image Festival annual print competition and 1st in the March 2010 Nature’s Best Photography weekly international competition. 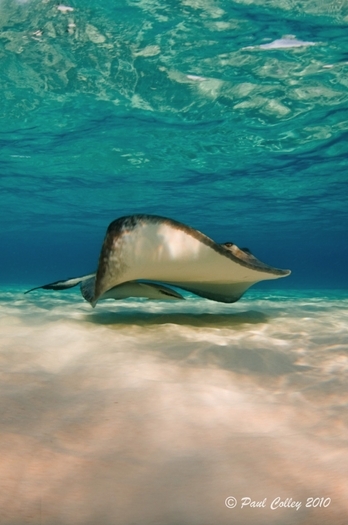 Dawn Stingray, Grand Cayman. Nikon D300, Tokina 10-17mm fisheye, natural light with Magic red filter. F10 at 1/50 sec, ISO 200. 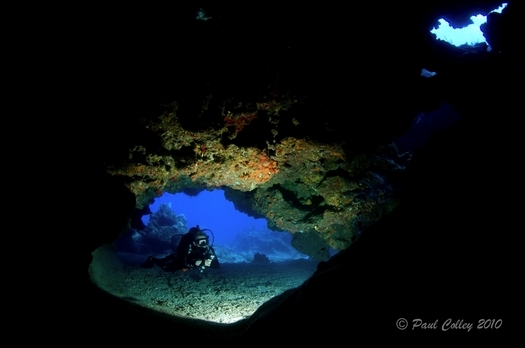 The second image is of a diver in a famous Grand Cayman swim-through at Snapper Hole, using an off-camera lighting technique. Alex helped his students to set this shot up by providing a remote strobe to illuminate the diver inside the cave, which was triggered by lighting from one of the on-camera strobes aimed at a slave sensor. For me, the shot is defined by the exposure technique, which brings out the strong blue background. This needed a medium f-stop and a correspondingly slow shutter speed. The composition is also important. Alex was keen that the student photographers included the small patch of blue at the top right hand corner, which adds balance and an implied strong diagonal to a very pleasing overall composition. The under-exposed inside of the cave also provides very strong contrast for the rest of the picture. This image came 3rd in a May 2010 British Society of Underwater Photographers competition and it also won a UK newspaper Daily Telegraph weekly photographic competition on the theme of solitude. Diver at Snapper Hole, Grand Cayman. Nikon D300, Subal housing, Tokina 10-17mm fisheye lens, INON Z240 triggering off-camera strobe. F8 at 1/20 sec, ISO 200. I hope that you enjoy these images as much as I have. But the real point of this article is to emphasize the importance to amateurs of good instruction. To that extent, I take my hat off to both of my instructors, who have, in the space of 1 day and one week respectively, helped me to take my photography to a far more pleasing standard. The journey started when my wife suggested that I should take a day’s tuition with one of the UK’s top underwater photographers, Martin Edge. 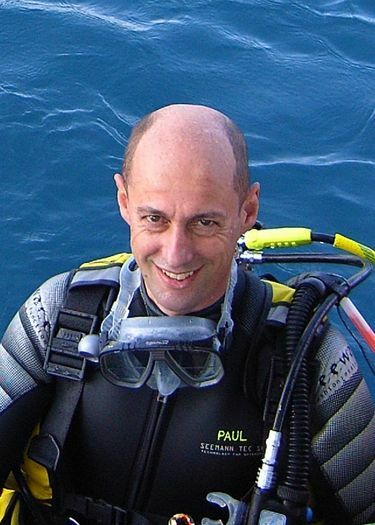 In July 2008, Martin taught me to look at the underwater world in a different way. 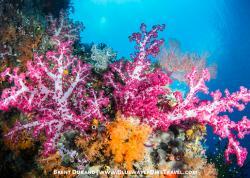 He set me on the right track to thinking about composition and many other vital aspects of underwater photography. The standard of the images that I began to produce after only one day was much higher than hitherto. With a busy full time job and only a few opportunities to dive each year, I soon worked out that the more effort that I put into thinking about photography, the more that I would get from my few opportunities to exploit it. Yet as vital as theory is, there is only so much that you can learn from books. If you want to improve quickly, instruction, dedicated coaching and constant practice are the best remedies for only average ability (like most divers, I am only an average photographer). I do practice photography top side, because that provides frequent opportunities to grip the technical aspects. But my progress underwater stagnated and, to build on the jump-start that Martin had provided for me, I joined one of Alex Mustard’s week-long photographic workshops in the Cayman Islands at the beginning of this year. Many people reading this will also know Alex who, like Martin, is a thoughtful and highly competent instructor. I simply cannot overstate the value of such workshops and thought that it would be useful to capture the essence of this particular one, which led to the two images above. 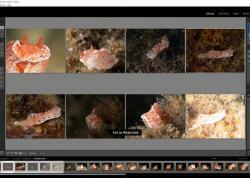 Alex’s workshop was dedicated to close focus wide angle underwater photography. However, there were ample opportunities for macro photography as well. His workshop began with a dedicated pool session to fine tune the correct placement of strobes. Valuable early lectures improved student understanding of how to capture and control light underwater. Alex encourages photographers to master the technical side in order that they can then concentrate harder on memorable shots; there is nothing more distracting to artistic thinking than paying too much attention to technicalities whilst underwater. One of the most valuable aspects of the workshop for me was an evening image review session, at which Alex and other photographers constructively critique your images. So, if like me you struggle to produce great images and have only limited time to invest underwater, consider taking some dedicated instruction. There are plenty of superb instructors out there. I am not setting out to advertise anyone in particular, and neither instructor mentioned here even knows that I have penned this article. Instead, I simply make the general point from my own experience that a modest investment at the start of your interest in underwater photography can pay handsomely in the satisfaction that you subsequently achieve from the quality of your images. Happy shooting to you all. You can also read more about Martin Edge’s workshops and Alex Mustard's workshops. 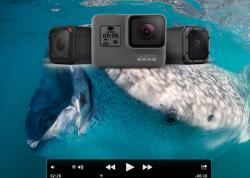 The Underwater Photography Guide also gives workshops in California.